It's no secret. Air and water are the foremost essentials in our life. 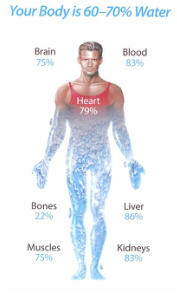 Here is will share the correlations of our thoughts and the water in our body in relation to what we think and become. Emoto’s book The Hidden Messages of Water was a New York Times bestseller. Emoto’s water crystal experiments consist of exposing water in glasses to different words, pictures or music, and then freezing and examining the aesthetics of the resulting crystals with microscopic photography. Emoto makes the claim that water exposed to positive speech or thoughts (intention) will result in “beautiful” crystals being formed when that water is frozen and that negative intention will yield “ugly” frozen crystal formations. In Emoto's rice experiment we can see the effect of the intentions or toughs on the rice and its effects. As you can see negative attitudes where destructive much the same as negative attitudes from ourselves about ourselves are. It's paramount for people to understand that personal success in the majority is a metaphysical attribute. This is what may be seen as luck but at success chemistry, we believe... unlucky people depend on luck, lucky people create their own! how? by learning the metaphysical attributes of your luck. Its the water...our memories, our feelings, our thoughts...all are frequencies resonated by the water within our cells. Whether those cells are plant-based or animal-based, everything is still water-based.